PHOTOS BY VICKI JOHNSON Randy and Christy Wiser pose for a photo after stocking the Blessing Box off Jefferson Street at the office of the Seneca County commissioners Friday morning. 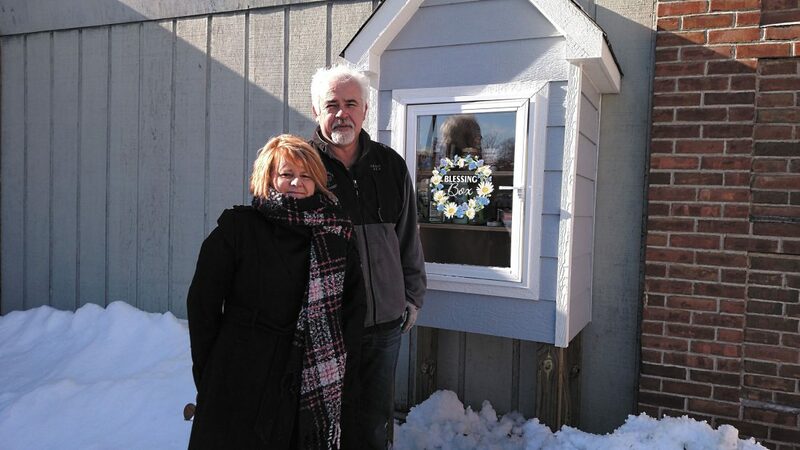 The first Blessing Box in Tiffin was stocked Friday. Anyone is welcome to drop off items at the box off Jefferson Street on the grounds of the Seneca County commissioners office, 111 Madison St. Items should be things useful to people in need, she said, with emphasis on personal care. However, canned food and other non-perishable items are welcome. She requests no clothing, except socks, gloves or similar small items. Donations must be new items. People in the community who can’t afford to buy personal care items are welcome to stop at the box and get what they need. The box is to be open 24 hours a day, seven days a week. Wiser said she got the idea in September after seeing Facebook comments from people asking where they could find personal hygiene products. She talked to Commissioner Mike Kerschner, Mayor Aaron Montz and other NOAH board members about the idea. NOAH is a community organization and an acronym for No One is Alone or Hungry. Wiser said her husband, Randy, and Jeff Overmyer built the box. The first donations have been materials to build the box from Lamtech and Zeis Construction as well as the Wisers, money to stock it from NOAH and toothpaste and tooth brushes from doctors Jeff Hoyda and Jack Felton. If the box is full, Wiser asked that donations not be placed outside of the box in any manner. She asked donors to save their items to be donated later. Wiser said she hopes there will be more Blessing Boxes in Tiffin’s future. “If this one goes well, we’ll talk to Mayor Montz and we would get together and discuss where another one would go,” she said. Kerschner announced during a recent commissioners meeting that the box would be in use soon. “Hopefully we’ll have a number of locations throughout the county in the future,” he said.